OK, let’s bring this closer to home. Looking at genealogies and relationships between folks in Hawaiʻi, you tend to see a pretty tight group of people who are either related to each other, or the families had worked together for a long time. On Kauaʻi, you hear the names, but the relationships aren’t evident. Keeping track of these folks is best done with the family tree. You’ll see that the gang above are all in the family. And, they link back to the Saint Claire clan of old. It started in January 1824 when Captain Francis S Sinclair married Elizabeth (“Eliza”) McHutchison (sometimes spelled McHutcheson) – they were both from Glasgow, Scotland. In 1840, the Sinclairs and their three sons and three daughters – George, Jane, Helen, James, Francis and Anne – made the move to New Zealand. Exchanging their Scotland land, they established the farm ‘Craigforth’ in a cove on the western side of Pigeon Bay on South Island. In 1846, Eliza’s husband and her eldest son, George, set off for Wellington. The ship, loaded with produce and with all the family’s savings on board, was wrecked somewhere along the coast. There were no survivors. Under the shadow of this tragedy, the widow and family persevered. One of the captains of the whaling ships that regularly visited Pigeon Bay, Thomas Gay, married Jane Sinclair in 1848 and they built a house at the bay. Then, Helen Sinclair married Charles Barrington Robinson, the former magistrate at Akaroa and the owner of extensive land holdings in Canterbury. Are you starting to see the connections? Wait, there’s more. In 1863, the Sinclairs decided to sell the Pigeon Bay farm and settle in Canada. Eliza and 13 members of her family sailed for Canada via Tahiti (captained by her son-in-law, Thomas Gay.) California was considered as an alternative place to settle, but they were persuaded to try Hawaiʻi. They travelled to Honolulu via Los Angeles, arriving there in September 1863. Kamehameha IV died on November 30 before the closing, so Land Grant No. 2944 shows his brother, Kamehameha V, completed the transaction in 1864. Sinclairs also bought land at Makaweli and Hanapepe on the adjoining Island of Kauaʻi. Ownership was subsequently passed down through the family. Francis Gay formed a company with his brother-in-law (and cousin) Aubrey Robinson – Gay & Robinson. Eric Knudsen, son of Anne Sinclair and Valdemar Knudsen, established the Eric A Knudsen Trust with extensive land holdings on Kauaʻi, as well. Niʻihau isn’t the only island this extended clan owned in the Islands. Around 1919, Gay experimented with planting pineapple on a small scale. He eventually sold his interest and James Dole’s Hawaiian Pineapple Company, Ltd. began the subsequent establishment of its pineapple plantation. The image shows the “Sinclairs” at the Makaweli House in 1893. 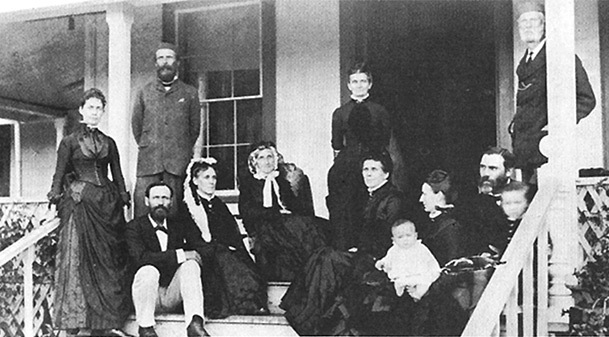 Seated, left to right: Francis Gay, Mrs. George Gay, Mrs. Eliza Sinclair, Mrs. Charles Robinson, Mrs. Aubrey Robinson with Aylmer, Mr. Aubrey Robinson and Sinclair. Standing, left to right: Eliza Gay, Francis Sinclair, Mrs. Francis Sinclair and Mr. Wodehouse. In addition, I have added other images in a folder of like name in the Photos section on my Facebook and Google+ pages.